I just celebrated my 28th birthday. I still had to work. I still had to grocery shop and make dinner. I didn't get to wear a paper hat, feather boa, or a party dress. But my students made me a card and gave me a new pencil sharpener and a candle. I got to talk to my mom, my sister and my best friend all in one day. Nate gave me a chocolate cake, staple gun (that I asked for) and my favorite perfume--Chanel No5 (that I would never ask for). He also delivered a card from Scarlett that made me cry. All in all I had a great day. Especially when I realized that soon I could plan birthday parties for Scarlett that involved paper hats, feather boas and party dresses! 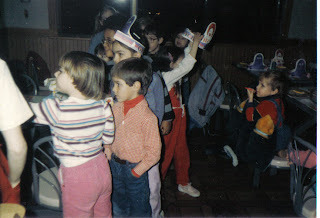 By the way, check me out rockin' the Dorothy Hammil haircut on my Ronald McDonald birthday! Kara, where did you find that pic? What a hoot! I love it. And I'm so glad I got to talk to you on your big girl b-day. Just a little while and you'll hop on the 30's train with me! I LOVED that hair-cut! You were such a party girl even back then.